Trust the foam roofing and insulation specialists at Corona Coatings Corp. to provide high quality polyurethane spray foam roofing, foam wall insulation, foam tank coating, and foam roof inspection and certification services at competitive prices for your Ontario home, business, or new construction project. In our over 35 years of doing business throughout the Inland Empire, our experienced technicians have performed spray foam installation projects for thousands of satisfied commercial and residential clients. In fact, a good portion of our new business is due to customer referrals, because the homeowners, business owners and building contractors we serve have been so pleased with the performance of our foam roofing and insulation systems and the customer service we provide, that they have gone on to refer our company to their business associates, family members, and friends. At Corona Coatings, our skilled application technicians each have 12 to 14 years of experience working in the foam roofing and insulation industry, and are required to adhere to a rigorous schedule of ongoing training in the use and application of the high-performance, durable polyurethane foam roofing and insulation systems we apply. Spray polyurethane foam (SPF) roofing and wall insulation systems provide superior thermal performance over conventional insulation systems, and are simply the most energy efficient insulation systems available for use in Ontario homes and businesses today. 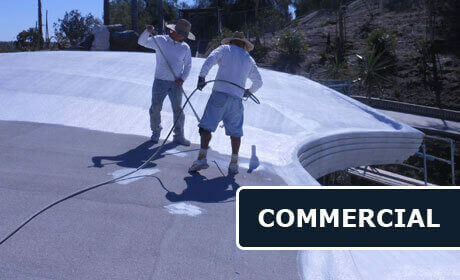 Call the foam roofing and insulation professionals at Corona Coatings. We are proud members of the Better Business Bureau (BBB) and the Spray Polyurethane Foam Alliance (SPFA), and we offer free onsite consultations and estimates to Ontario. Corona Coatings Corp. is licensed, bonded, and insured. At Corona Coatings, we have expertly installed our energy-saving spray foam wall insulation in Ontario since 1976. The type of insulation used in a building is very important, because it has such a large impact on regulating a home's or business's internal temperature. The type of insulation used in a structure also has a significant effect on the energy output required to heat and cool a building, and tends to have a significant impact on the day to day comfort of those inside. The decision to install polyurethane foam wall insulation in your Ontario home or business is a wise investment in your building's value and functionality. The insulating properties of closed cell polyurethane foam are far superior to those of standard fiberglass batt and cellulose insulation. Spray foam insulation possesses a greater R-Value per inch of thickness, offering greater thermal performance, and is more resistant to moisture and mold. In addition, it has greater sound-dampening properties, and is better at reducing sound transmission through interior and exterior walls, promoting a tranquil home or business interior. Corona Coatings Corp. is committed to educating Ontario homeowners, business owners, and construction industry professionals about the benefits of our durable polyurethane foam roofing, wall insulation, and storage tank coating products. Spray polyurethane foam products form a virtually uninterrupted environmental envelope over the roof and throughout the walls of a structure, providing a highly efficient barrier against airflow through the roof and walls, and preventing the inflow of outdoor dust, pollen, and other airborne pollutants. Moreover, the installation of spray foam roofing or insulation in new or existing construction may make the property's owner eligible for tax credits, energy company rebates, and other incentives designed to encourage sustainable development. At Corona Coatings Corp., we also offer Ontario free on-site foam roofing system inspections, during which our qualified foam roofing professionals will carefully evaluate the condition of your residential or commercial foam roofing system and recommend repairs as needed to keep your foam roof functioning exceptionally. 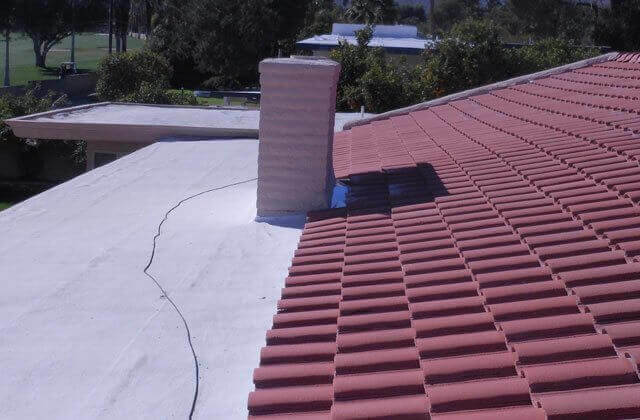 At Corona Coatings, our knowledgeable roofing professionals will only recommend the most cost-effective, essential repairs necessary to prolong the lifespan and functionality of your spray foam roofing system, and can custom color-match any needed repair with your existing roof color. Don't replace your existing Ontario residential or commercial asphalt-based flat roof roofing system with the same old troublesome roof, call Corona Coatings today. 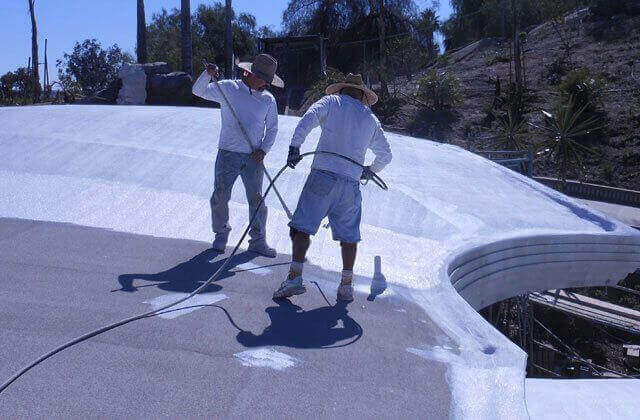 At Corona Coatings Corp., our skilled roofing technicians can typically apply our spray polyurethane roofing system directly over an existing asphalt-based roof, precluding the need for a costly, disruptive tear-off of the old roofing system, and can sometimes do so in only one day. 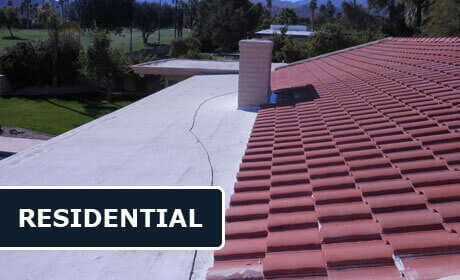 At Corona Coatings Corp., we stand behind our superior spray polyurethane roofs with a ten year warranty. At Corona Coatings Corp., we offer an annual routine maintenance service, because observing proper maintenance practices is vital to the life expectancy of your Ontario home or business polyurethane spray foam roof. During our maintenance service, our roofing professionals will remove all debris from your foam roof, evaluate the integrity of your foam roofing system, and recommend any required roof repairs. The typical life expectancy of a foam roof is 12 to 14 years, but proper maintenance practices must be observed to ensure maximal roof longevity. Corona Coatings is Ontario's first choice for residential and commercial storage tank insulation. At Corona Coatings, we have applied our spray polyurethane foam insulation to water tanks, grease tanks, chemical tanks, solar tanks, and have even insulated the wine tanks at local Inland Empire wineries. Our foam insulation enables these storage tanks to maintain an even temperature, reducing energy costs for our clients. Moreover, spray foam insulation also provides other benefits: It increases the structural integrity of storage tanks, and protects the surfaces of metal storage tanks from the development of rust and corrosion, prolonging their lifespans. Join our thousands of satisfied customers throughout the Inland Empire. Call us today from Ontario.